Puliyadharai- This is a popular Neivedhyam/Prasadam offered in South Indian Temples.This is a very traditional dish.It has nice tangy-spicy taste & great travel food. Soak the Tamarind & squeeze the juice from it. Heat the pan, dry roast the urad dhal, fenugreek seed & blend it & make a fine powder. Heat one tsp oil in a pan, add coriander seed,channa dal & five chillies & roast it & make a course powder. Heat oil in a pan, add mustard seed,balance red chillies,peanut,hing,curry leaves & allow to temper. Add turmeric powder, tamarind juice,salt & allow to boil. Add ground coriander, channadal, red chillies masala & allow to cook. Allow to cook until thick.Add fenugreek, urad dal powder & mix well. Finally add jaggery & mix well.Allow it to cool & keep it air tight container. 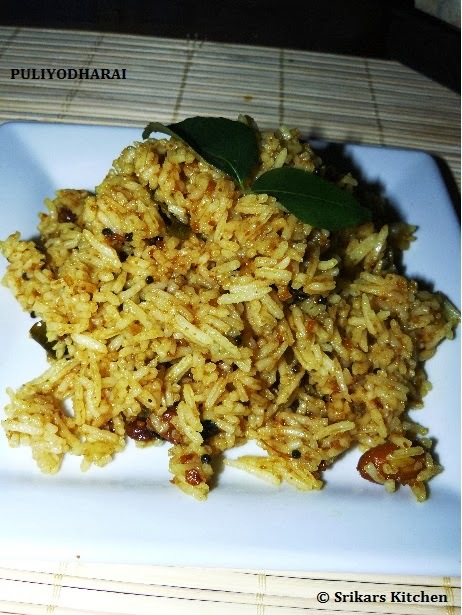 Take 2 cups of rice,add 1 tbsp puliyodharai & mix well. The best offering to God which is also delicious in taste. Its my all time fav though I seldom make it. Pefect for kids ...... Lovely ! wow tempting puliyodharai :) looks very delicious and yummy ! !